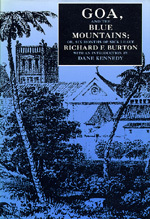 Published in 1851, this is the first book written by the famed Victorian explorer Richard F. Burton. It is an account of his journey through portions of southwest India while he was on sick leave from the British Indian army. Traveling through Bombay to the Portuguese colony of Goa, he went through Calicut and other cities on the Malabar coast, ending up in the Nilgiri mountains at the hill station of Ootacamund. The observant traveler, not the intrepid adventurer, is the narrator of the account, and its intended audience was the voracious Victorian consumer of travel literature. Coupled with a critical introduction by Dane Kennedy, this facsimile edition provides a revealing look at the people who inhabited a part of India that was generally off the beaten track in the nineteenth century. The Portuguese and Mestizo inhabitants of Goa, the Todas of Ootacamund, as well as the fellow Britons Burton meets on his journey are all subject to his penetrating scrutiny. Burton's clever, ascerbic, and unorthodox personality together with his irreverence for convention and his bemused disdain for humanity come through clearly in these pages, as does his extraordinary command of the languages and literatures of various peoples. "What a glad moment it is, to be sure, when the sick and seedy, the tired and testy invalid from pestiferous Scinde or pestilential Guzerat, 'leaves all behind him' and scrambles over the sides of his Pattimar." "Ah! we forget. The gondola and barque are household words in your English ears, the budgerow is beginning to own an old familiar sound, but you are right—the 'Pattimar' requires a definition." Richard F. Burton was a noted nineteenth-century British explorer, best known for discovering the source of the Nile. Dane Kennedy is Associate Professor of History at the University of Nebraska and the author of Islands of White: Settler Society and Culture in Kenya and Rhodesia, 1890-1939 (Duke 1987).